A couple of weeks ago we were invited to visit the Speedway Motors Museum of American Speed as guests of the museum. Even though it’s located in Lincoln, Nebraska, only 30 miles from our home, we’d never heard of it. After just a little more than an hour there, we couldn’t believe this place isn’t more well-known. Having visited many museums in the Midwest, this is one of the very best in this part of the country. Founded in 1992 by Bill and Joyce Smith (who also founded Speedway Motors), the 135,000 sq. ft. museum has three levels of the fascinating automotive memorabilia which the couple and their family collected over the years. Given the sheer size of the museum, we felt fortunate to have a guide, Dave, who took us on a tour and pointed out the highlights. Don’t worry if you don’t have a personal guide, as there are friendly, knowledgeable, and approachable docents located throughout the museum who are more than happy to help direct and explain what you’re seeing. 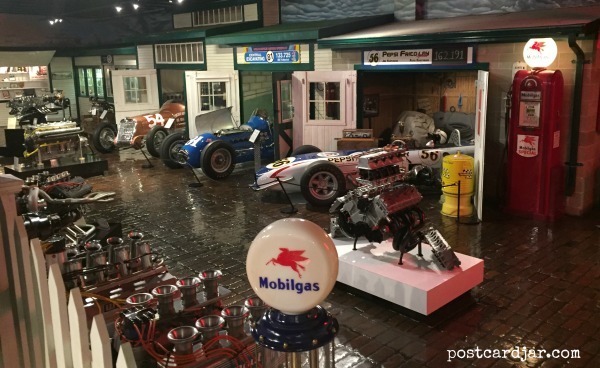 Our first stop was the Indy Pit, including a re-creation of the original Gasoline Alley of the Indianapolis Motor Speedway and the area of the museum dedicated to this iconic track. This special area incorporates one of the few remaining original garage doors from the speedway. The Indy Pit at the Museum of American Speed features a set of the original doors from the garages at the Indianapolis Motor Speedway. Dave told us that because the doors had been taken down for repair and were off site when the fire broke out, they survived the tragic fire that destroyed the rest of the structure. 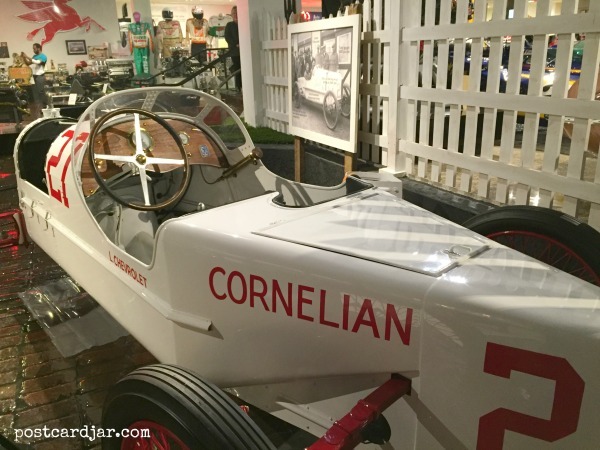 A special feature in this area is the Cornelian–a car driven by Louis Chevrolet (yes, that Chevrolet) in the 1915 Indy 500. The car driven by Louis Chevrolet in the 1915 Indy 500. It achieved a maximum speed of 81 mph. Another fascinating display features SAFER (Steel And Foam Energy Reduction) barrier walls. SAFER walls absorb the impact of a race car hitting the outside wall of the track, reducing the chance for injury to the driver. I knew these had been developed after some high profile deaths in motor sports, but I had no idea they were developed right here at the University of Nebraska-Lincoln and that a local big box lumber yard had a huge impact on the project. Apparently, the UNL researchers struggled to find a cost-effective material to put behind the steel to absorb the impact of a car. One day, one of them was in a lumber yard when he saw foam wall insulation sheets. The rest is history. The pink insulation used in SAFER walls is actually just foam insulation you can purchase at most home improvement stores. The museum has a whole bunch of hot rods. 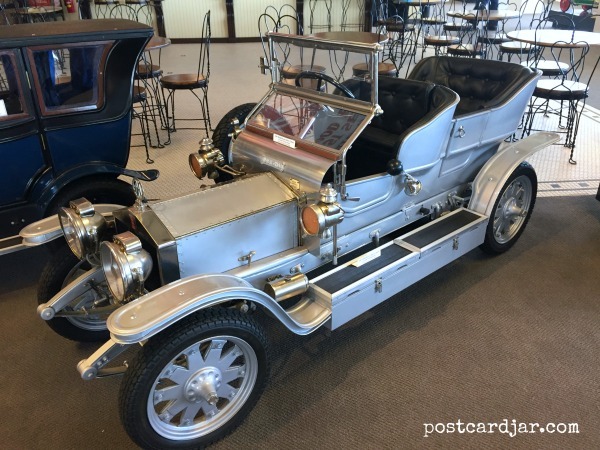 I was very excited when we ran into a full-sized version of a model car I owned in my youth — the Red Baron. This was first of several cars that was initially built as a model and only later developed as a full-sized replica. This Red Baron car was actually designed first as a model car later was the first to be made into a full-sized replica. 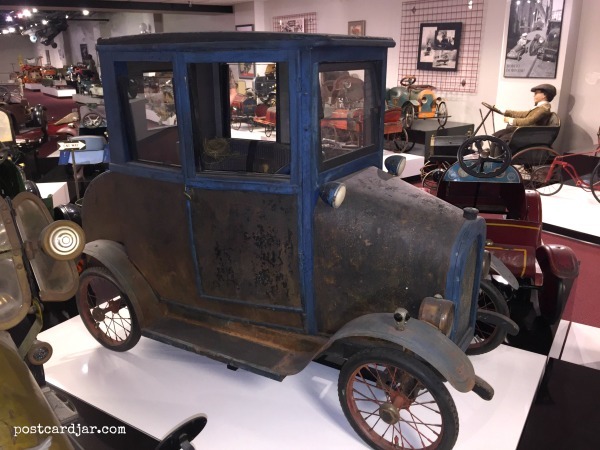 Another famous toy car built to full-size and displayed at the museum is the “Boothill Express,” a hot rod created from the actual funeral hearse that carried Bob Younger, James Gang member, to his final place of rest on Boot Hill. The museum is also home to the record-holding Streamline D/FS car that clocked 323.364 mph on the Salt Flats of Bonneville, Utah. Who knew all this was in Lincoln? We sure didn’t. This might be the cap that Bill Smith bought off the head of a New York cabbie. The museum largely contains Bill’s extensive collections. Tour guide Dave told us Bill’s wife, Joyce, started to feel left out since she wasn’t “collecting” anything. 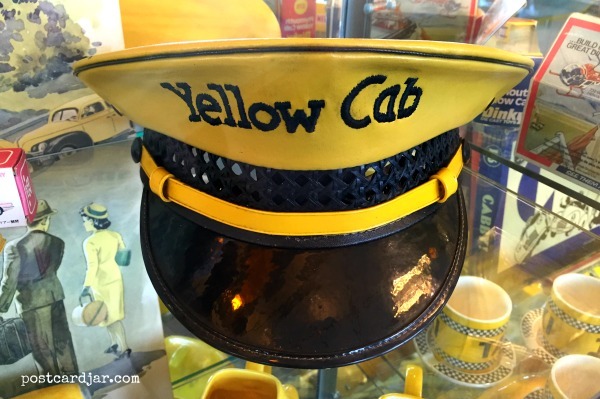 Bill suggested she start collecting taxi cab memorabilia and even took out his billfold on a trip to NYC and bought the cap right off the head of the driver for his wife’s collection. We later learned that that wasn’t the only time Bill made a spur-of-the-moment purchase for their collections. Once, Bill and Joyce were on vacation in Tijuana when they happened upon a carnival. There they found a carousel ride that had small race cars on it instead of horses. Joyce liked it, so Bill found the owner, took out his billfold (I’m catching a theme here), and purchased it. They brought it back to the museum in Lincoln, had it restored, and it works to this day. Click on the video below to see it in action. The museum is also home to the largest collection of pedal cars in the world and lots of toy cars. 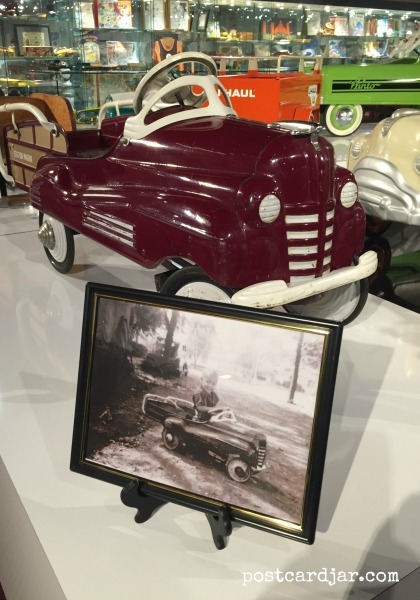 The young boy pictured here in a similar pedal car to the one on display was none other than our tour guide, Dave. While some are new or have been restored, most are displayed in the exact condition they were found. One, from Australia, even has a bird’s nest in the back window. 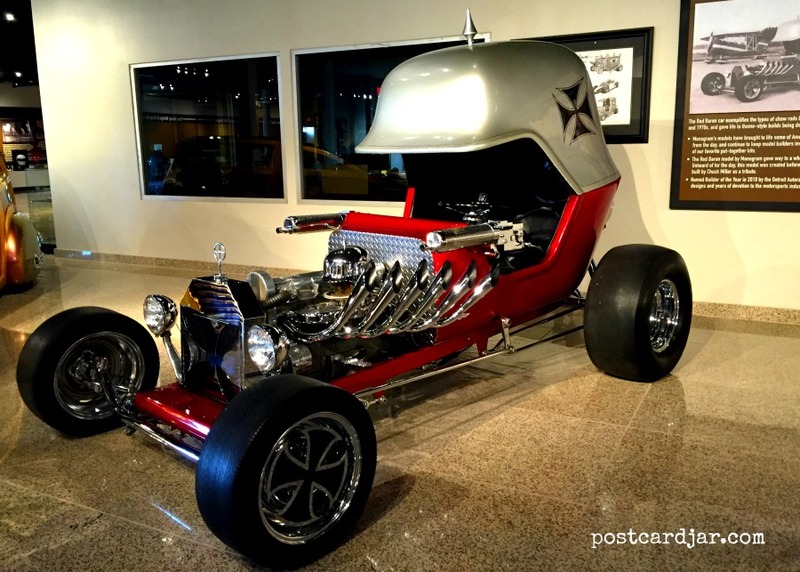 Check out the bird nest in the back of this pedal car! The pedal vehicles are fascinating–there are airplanes, race cars, and even boats. 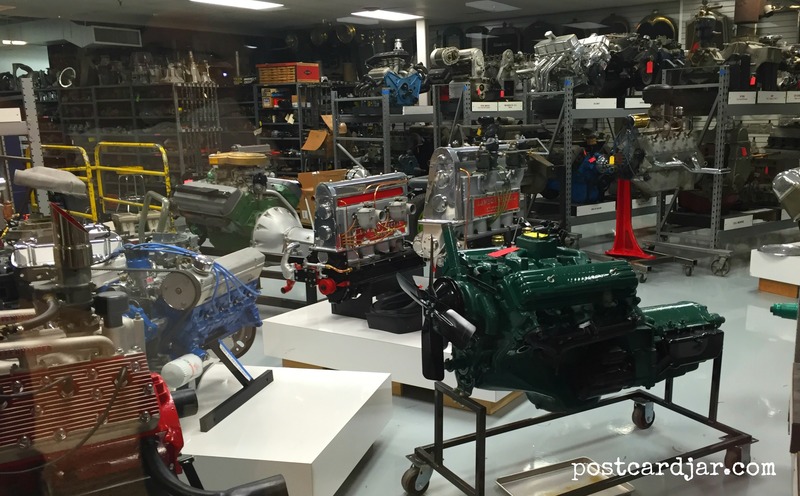 We spent over an hour walking through the museum and didn’t see everything–there are huge rooms with engines on display, some from race cars, some from muscle cars, and some that are one-of-a-kind. One of the engine rooms. There are hot rods, drag racers, and race cars driven by notables like Al Unser Sr. This museum has just about anything you can imagine that has to do with cars and speed. 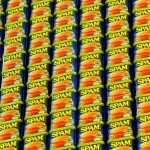 There are even collections of other things like guitars, movie posters, album covers, and even lunch boxes! 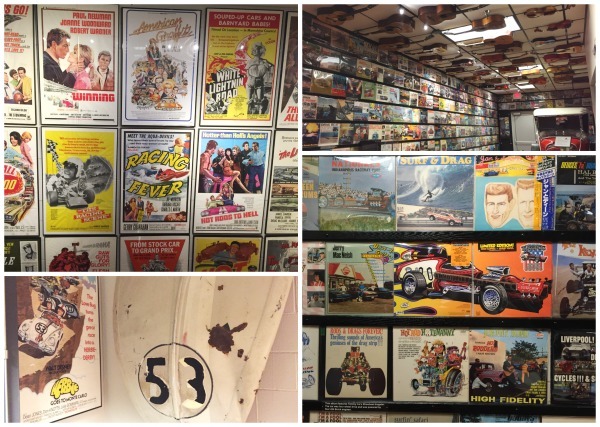 In addition to cars, the museum features collections of car related movie posters, album covers, guitars and movie memorabilia. Obviously, you don’t have to be a gear head to enjoy your time here or learn a little something. Ann and I brought my mother-in-law and a college student with us, and all four of us were fascinated by what we found. This is impressive considering the ages in the group spanned 40 years and both genders. When you put the address in your GPS, you’ll arrive at a small sign that simply says, “Museum.” Head around the corner, because you are in the right place and are about to go for a fantastic ride. If you’re from eastern Nebraska, put this museum on your list of must-see places in Lincoln. If you’re heading across the the state on I-80, make some time to plan a stop at this museum. Trust me, it will get your motor running. During colder months, the museum is only open Fridays from noon to 4:30 p.m. They will be switching to summer hours the first full week in May when the museum will then be open Monday-Friday from noon to 4:30 p.m. Admission ranges from $10-15 depending on age. Active duty military are free with ID. The Museum is located at 599 Oak Creek Drive, Lincoln, NE 68528. We just saw that and are very excited! I hope it does get a huge number of folks involved, because it’s a great museum and people need to see it! Thanks, Dave! We were just amazed with this one-of-a-kind collection and how thoughtfully everything was put together. The Museum of American Speed is a real Midwest treasure.